The 2017 Dubai Tennis Championships tennis tournament for men players on the ATP circuit is taking place this week from February 27 to March 4, 2017, on the outdoor hard courts at the Aviation Club Tennis Centre (photo below) located in Dubai, United Arab Emirates. Here is a list of the prize money up for grabs for the men tennis players at the 2017 Dubai Tennis Championships. 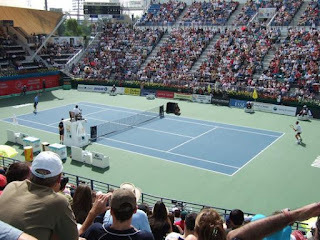 The 2017 Dubai Tennis Championships is a ATP World Tour 500 Series tournament which is the 3rd tier of tournaments on the ATP circuit behind the Grand Slam and 1000 Series Tournaments Series. All prize money below is in American dollars. The prize money is not cumulative, players only earn the amounts shown for the last round they advance to. Total prize money up for grabs is $2.859 million which has attracted a very good field. The highest ranked players in the tournament are Andy Murray from Great Britain, Stan Wawrinka and Roger Federer from Switzerland, Gael Monfils from France and Tomas Berdych from the Czech Republic.